Hi everyone! 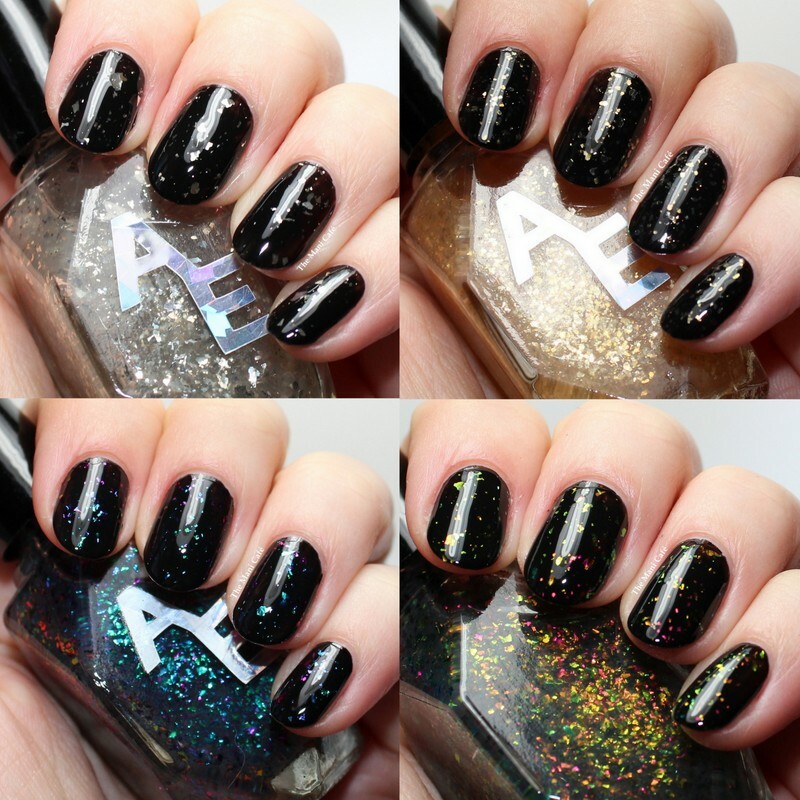 I have the new flakie topper collection from Alter Ego. This collection is made up of different clear-based polishes with multichrome metallic flakes. I'll note now that unfortunately I'm missing one of the polishes, Fall for Fall, which was unfortunately broken in the package. So please do check out swatches from other bloggers for that one! Meanwhile, here are the rest of them! I swatched each polish in one coat over a one coater black creme. I love flakes over black as they really pop. I didn't use topcoat for photos. The formulas were good and I didn't have to fish for flakes at all. I feel like one coat gives the perfect amount of flakes for my liking, the result isn't too busy but not too sparse either. Moon Mother is a clear base with silver metallic flakes. Payola is a clear base with gold metallic flakes. Envy This is a clear base with purple-green-blue shifty flakes. Fire Light is a clear base with pink-orange-green flakes. The Top This polishes are available now in 2 sizes and for Cynthia's regular prices 8.5ml for $4.75 and 17ml for $9.50. Thank you for your thorough review! Your manis and photos are all stunning!